Homeowners use their garage doors several times a day, every day. Regular use adds up to a significant number of repetitions of going up and down (e.g. : 365 days x 3 times a day = ± 1100 per year) and the resulting wear and tear means garage doors do go wrong and sometimes break. The reliability and convenience of their garage door means owners take them for granted, and forget that like all machines, these doors require regular maintenance to ensure they keep working year after year. And, of course, there is sometimes abuse as well (like bumping the door with a car, or children hanging on the door as it goes up). This means that garage doors do sometimes stop working or go wrong and then they need the service of professional repairs. Garage door drops: Manufacturers try and keep them as light as possible, but garage doors are heavy pieces of machinery with a single car doors weighing in the region of 50kg and a double door around 100kg. If something goes wrong with the tension in the counterbalancing/torque springs, or a spring breaks, the door can drop quite rapidly and dangerously. Note: One of the safety features in the design of these doors is that the springs almost never fail while the door is fully open, as the springs are only tensioned / torqued up as the door closes, so they tend to fail when the door is closed or almost closed. If you notice that one of the springs has failed, for safety, you and your family members should stop using the door immediately and schedule a professional to look at it. This is not only because the door is dangerous and heavy when it closes rapidly, but because a spring will typically lift in the region of 40 - 50kg, and that is an enormous amount of force that can be explosively released if you make a mistake while working on the door. You should also call a professional if you think your door is closing unpredictably, or if it continues to close under its own load when you stop it while partly opened. 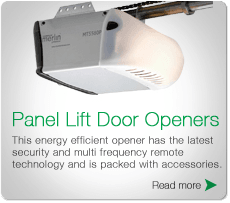 No response to door opener: If your door is fitted with an Automatic opener, they are quite a complex machines, with several components that can go wrong and may need repair during the lifespan of the door. If the opener does not respond, or seems to be sluggish, when the push button or remote is used, this could be for several reasons, starting with something simple like a flat battery in the remote, through to something like a damage or failed PCB (Process Control Board). Diagnosing and tracing electrical and electronic faults, can be tricky, (and expensive if you get it wrong and buy the wrong component online), so call our technicians to check the system and diagnose the fault so you can decide on the repair. Garage door will not close: For safety reasons door can be fitted with IR (Infra Red) beams that stops and reverses your door when it is closing and something like a child, car or pet passes through the opening. Note: These sensors are an excellent safety feature, and we recommend them to all property owners. If these IR Beams are working as they should, and they are “cut”, the door should stop closing and reverse its motion and return to the fully open position. If they are cut while the door is opening, it will continue to open as this is the safest position if something is in the door opening. But if one of these IR sensors fails, or it receives a knock that misaligns it, then the homeowner may find that the door will refuse to close or move once it is in the up position. Or if the alignment is marginal, you may see an unsystematic pattern of door motion, as it stops, starts, and reverses for apparently no reason. If this is happening, call our technicians so they can check the IR beams and other safety features. 4. Track misalignment: With improvements in technology new, modern garage doors usually move smoothly and quietly in their tracks as they go up and down. Older garage doors with worn out tracks or rollers may have become misaligned and therefore noisy as they rattle and squeak up and down. If the misalignment and wear is significant, the rollers could fall out the tracks, the door could jam, and even the cables my come off the drums and wrap around the axle. This misalignment should be visible or audible immediately, and then it is recommended that you stop using the door and call our technicians so they can check it and repair it. Sometimes you only discover that something has gone wrong retrospectively (like a Roller coming out of the track, or a cable flipping off the drum) when you try to open the garage door & it sticks or grinds. Ehen this happens, don’t try to place the door back on its track by your own as this could end in injury or damaging the garage door. Leaving the door as it is will also assist the technician in diagnosing the real problem, but if you have already taken it apart yourself, he will first have to reassemble the door, before trying to work out why it went wrong, and this is a much more time consuming and costly repair. For expert garage door services in Brisbane, including both routine and emergency garage door repair and maintenance, you can trust the experienced team at [Brisbane Automatic Garage Door Openers](http://www.brisbaneopeners.com.au/). Call 0424 313 713 now or Email admin@brisbaneopeners.com.au! We deal with sectional garage door motors. Our garage door openers are compatible with both single and double sectional or tilt garage doors and are the most secure on the market. We have the experience and trained expert to set up your sectional garage door motor with a programmable central control through display for long term solution. Call 0424 313 713 now or email admin@brisbaneopeners.com.au for an inquiry. Have you ever pulled into your driveway after an exhausting day at the workplace just to discover that your overhead door does not open when you hit the button? Yes, this is not a fun thing at all, especially when you’ve no idea what went wrong. Wear and Tear: This is perhaps the number one reason why overhead door spring malfunction. The typical torsion spring will last for nearly 10,000 cycles. A cycle complete when the door goes up & then come down. Even if you were to just leave & come back once all through the day, that still equals to 2 cycles per day. That being said an overhead door spring would simply last for a little more than 13.5 years. However, a lot of people open & close their garage doors several times all through the day, running many cycles, reducing that lifetime to far less than 13.5 years. It’s even feasible to go through 10,000 cycles in about a year. When rust accumulates on the spring it can make it to easily breakdown & the lifespan of it to be reduced. Rust makes friction on the coil & weakens it also. You can avoid spring break down because of rust by spraying down the coil with a lubricant in regular interval, which keeps it both lubricated & from accumulating rust. No doubt wear& tear can eventually make the door spring to break. But, by doing required maintenance you can extend the spring’s life considerably. The 1st thing to do is spray down the coil with lubricants a minimum 3 times a year. Furthermore, you must check out the overhead door balance every season. We’ve found that a lot of people face spring breakdown problems during the winter, so scrutinizing it more regularly during that time is advocated. Your overhead door springs will probably fail sooner than later when you use wrong spring length or wire size. Correctly maintained & built overhead door must have 2 torsion springs, one on each side. Though broken garage door spring are widespread because of the different reasons mentioned above, that doesn’t mean you’ve to put up with that inconvenience. Brisbane Automatic Garage Door Openers offer quality garage door repair in Brisbane that also includes prompt spring repair. We assure that we can have your overhead door running again in no time. Call 0424 313 713 now or Email admin@brisbaneopeners.com.au for a service quote. Brisbane Automatic Garage Door Openers is Brisbane's premier provider of garage door maintenance and repair services. Whether you need urgent garage door repairs in Brisbane or looking to upgrade your garage door. We are specializing in roller door repairs, gate repairs, installation, maintenance, service for commercial, industrial residential doors in Brisbane. Call our experts now on 0424 313 713 now or email admin@brisbaneopeners.com.au for an inquiry. Even though you mightn’t always find a broken garage door spring, the signs of it are very clear & different as long as you know what to look for. But the question is why overhead door springs break down in the first place? Is a broken overhead door spring is a rare instance, prompted only by a particular incident, or is it a typical occurrence that occurs steadily over time? Well, the answer is – it can be both. Let’s go through a few common reasons of a broken garage door spring. Rust: Overhead door springs are made from metal, so they are susceptible to decay. If any rust builds up in the spring, its durability can be reduced by years. Decay deteriorates the coiled spring & also augments the amount of friction, making it to wear quicker. Poor Maintenance: Though overhead door springs don’t need extensive care & maintenance, but they can’t also be left totally overlooked. It is wise to check the balance of the overhead door every year. Regular wear: While it’d be great if the garage door spring lasted forever, the truth is that the simple action of opening & closing the door numerous times every day are not easy. It is hard on the spring, even though they are designed specifically to do this task. Most garage door springs are made to last long, but they will not last for lifetime. The everyday wear & tear of endlessly opening & closing of the door breaks the spring down and eventually, they have to be repaired or replaced. Cost saving schemes: Everybody wants save some cash. Unfortunately, there’re some areas you simply cannot ignore and this definitely includes your garage door spring. As much as it might be alluring to buy cheaper spring, or may be to purchase one spring where 2 are requires, these attempts to save cash will only end up costing you more money in costly garage door repair. When you invest on proper springs, they will last for many years. When you cut corners to save some dollars, the spring will wear out quicker, meaning they will need to be replaced much faster. There is never a convenient time for your overhead door spring to break down. When this vital component breaks down, you need garage door spring repair or replacement job quickly. And for this you can always trust Brisbane Automatic Garage Door Openers – your one stop garage door service in Brisbane. For any garage door spring emergency, Call 0424 313 713 now or email admin@brisbaneopeners.com.au. A garage door opener allows the door to be opened and closed without the driver having to leave the car when arriving or leaving their property. No matter the type of style of garage door, there is an automatic system that can be installed to it. There are many benefits to having an automatic garage door opener installed on your garage door but none more important than safe access in and out of the property. When it comes to maintenance, nothing is more important than having your garage door and garage door opener checked. It is important to have your garage door and garage door opener serviced, adjusted, and tested to ensure that everything is functioning properly. There are many brands of garage door openers available to suit different sized and types of garage doors. Choosing the correct garage door opener for your application is essential. A garage door can weigh anywhere between 50 – 150kg. Over time your door will require periodic maintenance to ensure that everything is working at its optimum level and is not causing any unnecessary wear and tear. It is also essential to make sure that all your garage door opener accessories like photo eye beams and your safety system are tested regularly. These accessories prevent the garage door opener from operating and closing on a person, animal or vehicle. Garage door openers are operated by remotes which can be used from inside the property or in addition, accessories like keypads can be installed outside the home so that access can be given to anyone who needs to enter the property through the garage door via a 4 digit pin.